Rose, showered and walked Mix before breakfast after which David arrived to drive us all (Mum, Rachel and me) to church in his Jaguar! We arrived in style for the service conducted by members of the congregation with John preaching the sermon on the story of the golden calf from the Book of Exodus. It was very well done and a reminder of how talented are the congregations of our Church, itself a tribute to the leadership of those congregations over the years. There was no coffee after the service today – some hiccup or other – so we came back to Mount Pleasant where David, Rachel and I had a coffee in the summer house; Mum went off to sort her things out. We had lunch in the farm house soon after one and then I came across to the summer house to try to make another post on my www.mountpleasant.scot web-site. I completed that satisfactorily and if you are looking for more pictures of our trip to the Heavy Horse Show yesterday you will find them on that site. Scott and Sue popped in for a few minutes to regale us with tales of their holiday down south. They had a good time and particularly enjoyed their bed and breakfast stop last night at Richmond in Yorkshire. Olive had a student to tutor this afternoon while Rachel went off to Berwick for Evensong. The roofer arrived to deposit materials for his workers tomorrow, and later, in the evening, Mum, Olive, Rachel and I watched the latest episode of Downton Abbey before I walked Mix and went to bed. Today has been a good day and one in which I haven’t strained my body at all. 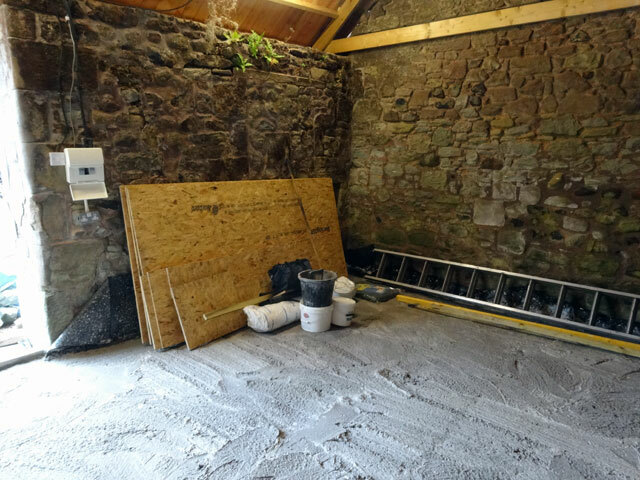 I’m hoping that just as the concrete in the Bothy has cured, so has my body from all of its exertions.